The Moroccan community in New York took part for the third time in the New York International Festival of Cultures, held Saturday in New York with the participation of more than 20 countries. The Moroccan float, beautifully decorated with Moroccan and American flags, offered several aspects of an age-old heritage. Moroccan handicraft and carpets were exhibited during the event. Different ceremonies showing rituals of Moroccan marriages, celebration of henné when the bride sits on the 'Ammaria' and the You-Yous of young girls dressed in caftans, were also scheduled. Manhattan became vibrant with the popular sounds and dances of New Yorker Gnawas and Washington Aissaouas. 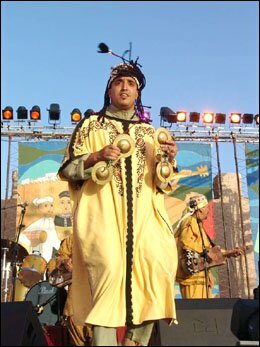 In a festive and colourful environment, members of the Moroccan community, who came in great numbers to take part in this parade, wore traditional Moroccan clothes including Jabador, White Jellabas, Tarbouch (Fez) and Balgha (slippers), besides Mlehfa Sahraouia or Berber Daraiîas and blue Chèche from south Morocco. Abderrahim Beyyoudh, the Moroccan Vice-Consul General in New York, Hassan Khantach, Morocco's Consul in Washington, and other personalities attended this original event.